Summer flew by more quickly than I anticipated. It was a whirlwind of post-graduation stress and job hunting that culminated in last week. A week consisting of four job interviews, three offers, hours of negotiation, and waaaay too many decisions for this gal to handle. The good news is it's over, I'm starting a new job next week! Thus starting a new routine of commuting to midtown Manhattan every day and finally being able to pay rent again (as exhilarating as the last year has been, I am Ready, with a capital R, to get some stability back in life). But for now, while there is still time left, I am taking it easy and enjoying the last of the waning summer produce, starting off with some asparagus, sweet peppers, and tomatoes. 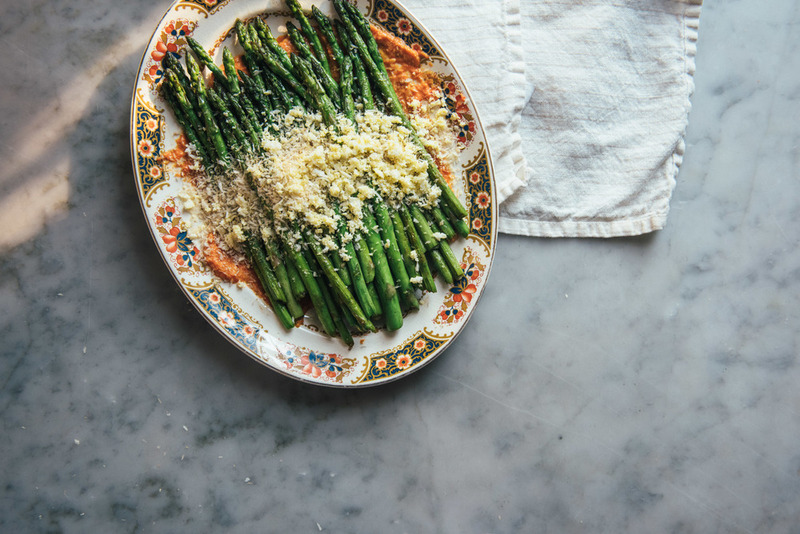 This recipe, though it features asparagus, is really a love ballad for romesco sauce: a roasted red pepper sauce that packs huge flavor in a few simple ingredients. Romesco is one of those things I didn't really notice until a few months ago. I was aware of its existence, but didn't give much thought toward actively seeking it out. It was kind of like that kid who you went to school with but never paid much attention to until they did or said something one day that catches your eye, and then you're hooked, the obsession begins. The first time I took notice was on a cauliflower sandwich from a shop in my neighborhood, the sauce playing up the flavors of the roasted cauliflower, pickled fennel, red onion, and arugula perfectly. The second time was with artichoke halves at a tapas place in the East Village where when the artichokes ran out, I started spooning the sauce into my mouth straight. After that, I absolutely had to make it at home so I could drown everything in it. You could pair any kind of vegetable with romesco sauce and it would be delicious. Here I've done a simple pan fried asparagus (in butter of course! ), then topped it with some crispy panko and a hard boiled egg pressed through a mesh sieve. But when autumn and winter roll around (sob), it would be equally wonderful on some winter squash or root vegetables. Heat oven to 425 degrees F. Place red bell peppers in a baking dish. Place tomatoes in one layer on a baking sheet. Rub a thin layer of olive oil on the outside of the peppers and on top of the tomato slices. Place tomatoes on the top rack and peppers on the bottom rack of your oven and roast for 30 minutes. At the 25 minute mark, place cubed bread on another small baking sheet and place in oven to toast for 5 minutes. Remove peppers, tomatoes, and bread from the oven. Cover peppers with aluminium foil and let cool for 20 minutes or until cool enough to handle with your hands. Peel peppers and remove seeds. Place peppers, tomatoes, bread, garlic, almonds, red wine vinegar, salt, cayenne and paprika in a food processor. Pulse until blended but still chunky, about 30 seconds. With the motor on, slowly drizzle in olive oil. Blend for another minute. This will result in a slightly chunky sauce, if you prefer a smoother texture, keep blending until you reach your desired consistency. Using your fingers, press the egg through a mesh sieve into a small bowl. Set aside until ready to serve. Spread half of the romesco sauce on the bottom of a serving platter. You can reserve the rest for future use or serve it alongside the asparagus for anyone who would like extra. 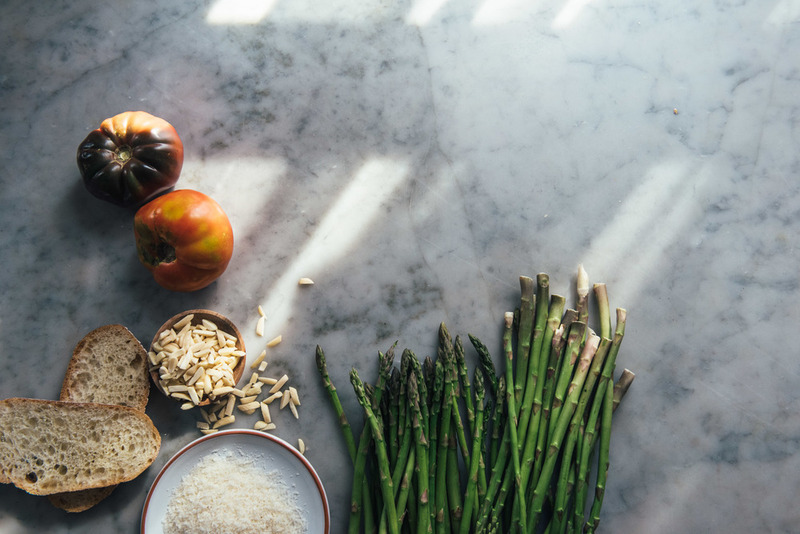 To prepare the asparagus, heat a large stainless steel skillet over medium to medium-high heat. Work in batches if necessary so you don't overcrowd the pan. Melt butter in the heated pan, add asparagus, a pinch of salt and pepper, and cook, tossing frequently, until bright green and slightly tender, about 3 minutes. Transfer immediately to the serving platter, placing the asparagus on top of the sauce. With the heat still on, add panko to the same pan and toss with the residual butter until golden. Sprinkle the panko and egg over the asparagus and serve immediately.